On Sunday the 14th of June I gave an excursion for Starters4Communities. After reaching their target with for a crowd funding campaign, several of their investors could sign up for a morning bird-walk in the Groene Jonker. We met on the Parking lot at the Groene Jonker. 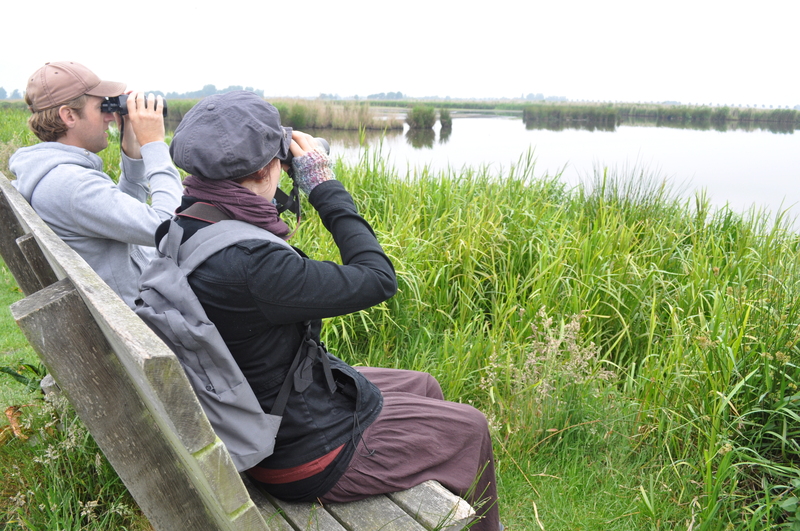 We were the first ones out on this beautiful wind still morning and while I was still explaining a little something about this birding-hotspot in ‘Het Groene Hart’, 3 black birds zipped overhead and landed in the swampy pond right next to us; Glossy Ibisses (Zwarte ibis)! The day could not have started better. These giant black decurved-billed waders are not only very neat-looking, but also very uncommon visitors to the Netherlands. We slowly proceeded over a path that led us straight through the mosaic of wet grasslands, reeds and mudflats. Because of the wind still conditions warblers sang from every direction, even though it was already at the tail end of spring. 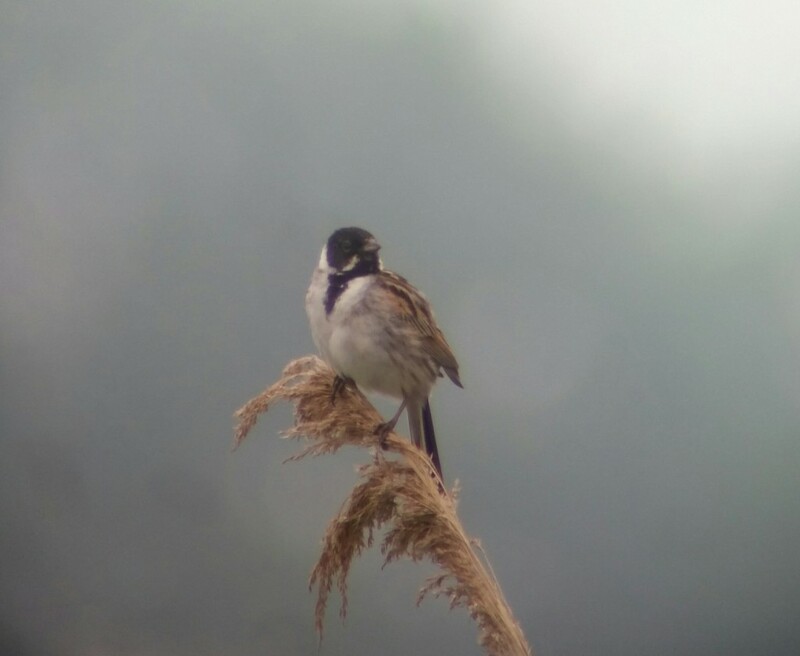 Reed Warblers (Kleine karekiet) and Sedge Warblers (Rietzanger) were both common, but the stars of the show were definitely the constantly rattling Savi’s Warblers (Snor). These birds make up for their rather drab-looking appearance with a spectacular cicadae-like song that carries for half a kilometer! We arrived at an open stretch of water and mudflat and immediately found a Black-necked Grebe (Geoorde fuut), lots of Black-tailed Godwits (Grutto), a Ruff (Kemphaan) and a couple a Garganeys (zomertaling). All these species are highly depended on wetlands like the Groene Jonker. Because wetlands throughout their range are shrinking and drying out and because they are hunted upon in their wintering-grounds in Africa, all these species are declining rapidly throughout their entire range. After a wonderful lunge provided by Starters4Communities we proceeded again. Good birds came thick-and-fast. A distant Purple Heron (Purperreiger) was quickly followed by a Great White Egret (Grote zilverreiger) and even better a Black Tern (Zwarte stern) that decided to forage for small fish barely 10 meters away from us! 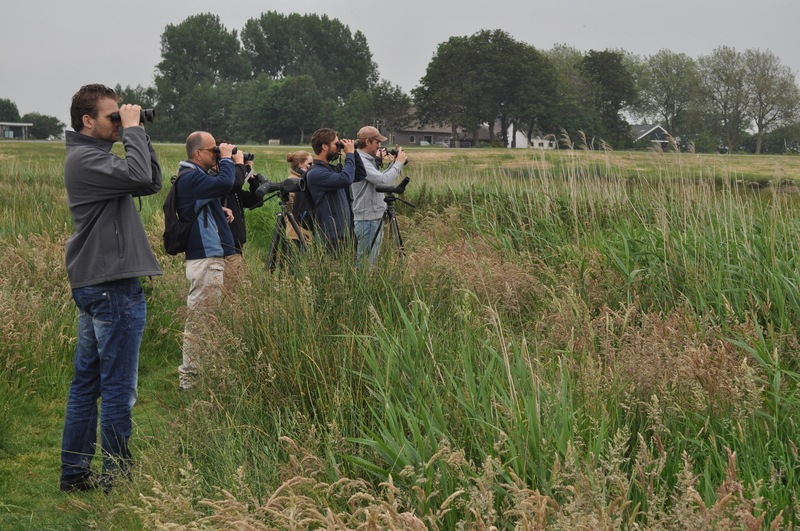 The whole group was in awe of a ridiculously tame displaying male Bluethroat (Blauwborst). The bright blue chest, with white ‘star’ and rufous breastband, combined with a bright yellow beak and rufous sided of its cocked tail, make it our version of the Wallace’s Birds-of-paradise! We obtained frame-filling scopeviews of these bird. Last but not least was a fine selection of tringa-waders. 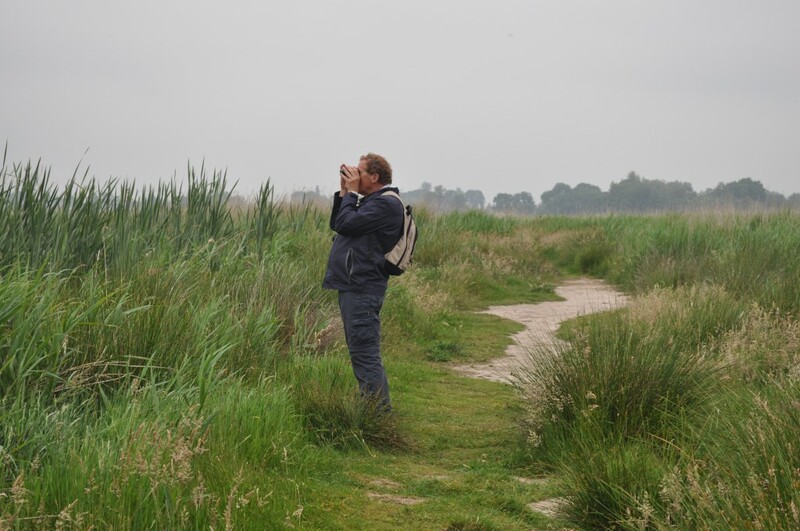 Several Green Sandpipers (Witgat), Common Sandpipers (Oeverloper), a Wood Sandpiper (Bosruiter) and a beautiful summer-plumaged Spotted Redshank (Zwarte ruiter) gave fantastic views as they stood among a group of Common Redshanks (Tureluur). We ended the excursion with a Great Crested Grebe (Fuut) that devoured a young pike right in front of its young, very cool indeed! Great Crested Grebe (Fuut) One adult carrying its young on its back while its partner caught a baby Pike, their sworn enemy! Great White Egret (Grote zilverreiger) 1 bird overhead. Glossy Ibis (Zwarte Ibis) 3 birds gave fantastic views. Wood Sandpiper (Bosruiter) 1 among several Green SPP. 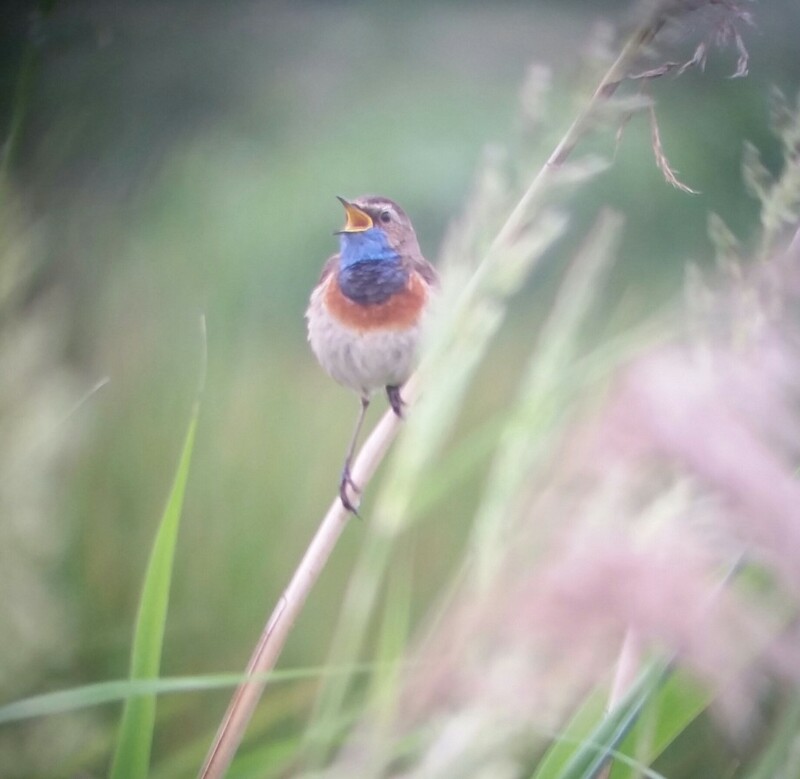 Bluethroat (Blauwborst) Exceptional views of several birds. 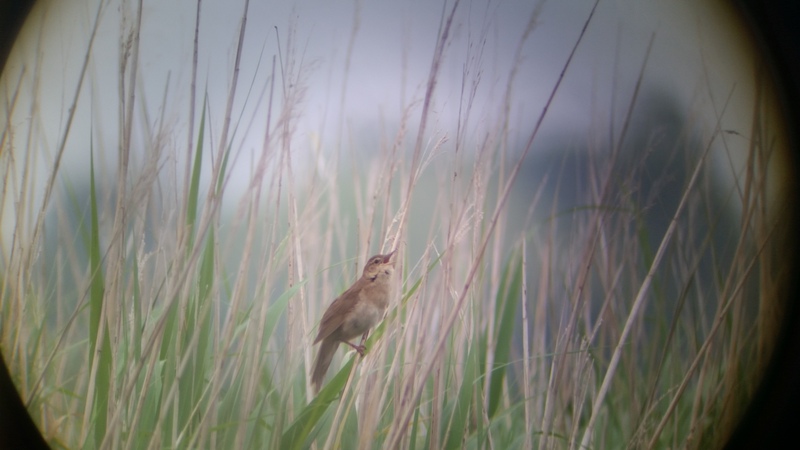 Savi’s Warbler (Snor) Exceptional views of several birds.